Taking the trash to the bin! Shelby giving me cuddles bless her! Packed and ready for my sleepover! Did someone just say chicken? Could I look any cuter? Abbie is just the happiest dog ever! I just melt when I see Ted! Peggys first time in the snow! Its my stick... no it's my stick! Ronnie prefers the thrower than the ball! Come on then, throw the ball! Look no further, I'm your Fairy Dogmother! I offer a real home from home, personal service and will only board one clients dog at a time, so you can rest assured they will get my complete attention, I'm fully licensed and have many years experience with different breeds, so your pets are in safe hands with me. I'm a real animal lover but dogs are my ultimate passion, I decided to leave the corporate world after 30 years and have a complete change of career, so this is ideal for me and it gives me a real sense of fulfilment, best decision I ever made! 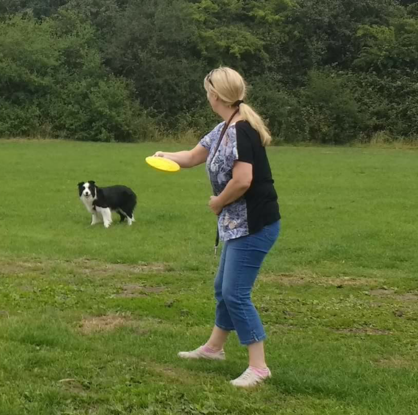 I'm a fun loving person and really enjoy getting out in the fresh air but walking with a pooch or two and playing fetch makes it so much more pleasurable, I love the cuddles afterwards too! I walk several dogs regularly and have really built a lovely bond with them. I live near a fabulous Country Park in Redditch, which is where I mainly walk my clients dogs, it's great for the dogs socialisation too. I also chauffeur pets to appointments at the Vets or Groomers on your behalf and will send regular photo updates, so they can see their pets whenever they wish to ensure they have a stress free holiday. I will only board at my home once I have met the dog, this also helps them when they return for the booking as they will recognise me and environment. Live-in pet sitting is another service I offer, some owners may have several pets that need to stay in their own home, so I can move in to care for all of them. I also provide a wedding chaperone service if you wish your dog to be part of the ceremony and photos, then I can take them home with me whilst you enjoy the rest of your day. My dog walking services start from 30, 45 or 60 mins. I will gladly provide references from my current clients. I'm a trusted keyholder at several clients homes. UK Animal Transporter Licence Type 2. Full clean driving licence for 30 years. 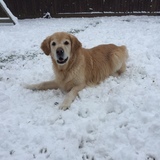 Andrea looked after Samson our golden retriever for 4 nights recently. She is very professional and right from our first meeting I could tell she is a dog lover and cares about the dogs she looks after. She asked lots of questions about his routine so that she could give him home from home care. Samson was very well looked after and Andrea really put our minds at rest with her kind and caring attitude. She also sent lots of photos during Samson's stay which was very much appreciated. I would highly recommend her. Andrea is an absolute "diamond".it is a privilige to have been able to book her.her care is second to none with love and dedication given on a one to one basis including lots of time out in arrow valley park and home play.a very professional lady,safe ,secure,even updates for clients like me that need reassurance.my dog wanted to stay when i came to pick up thats how happy there my dog was! .i am not a writer so i cant find the words to express my gratitude if this review helps you decide then all i can say is i give Andrea 100 stars rating! The photo updates were brilliant and very reassuring. Missie seemed very relaxed and at ease especially as this was the first time she had stayed with anyone outside our immediate family. Andrea provides a wonderful caring service. She is calm and kind and I felt comfortable leaving my puppy with her even though it was the first time he'd been left anywhere. She asked lots of questions about his needs and routine and followed things closely to make everything seem normal for him. I appreciated the photos and updates she sent throughout his stay. He has returned a very happy and stable dog and seems to have thoroughly enjoyed his holiday. We met Andrea before she had belle, a lovely polite lady and made us and Belle (Siberian husky) welcome on day. Belle seemed really happy to go on the day and came back to us a excited dog. Everything went well with staying over we've never left my belle with anyone apart my daughter. I felt at ease I would definitely use Andrea again I was happy and so was Belle.